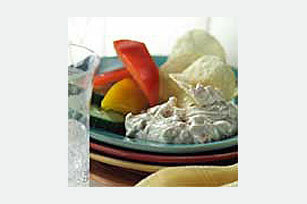 Kicked up with Worcestershire sauce, garlic salt and lemon juice, this creamy Clam Appetizer Dip is just as good as your childhood memories of it. Drain clams, reserving 1/4 cup of the liquid. Mix clams, reserved liquid and remaining ingredients until well blended; cover. Refrigerate several hours or until chilled. Serve with cut-up vegetable dippers or potato chips. Prepare as directed, substituting 1 can (4-1/4 oz.) shrimp, drained and rinsed, for the clams.